When you or a loved one needs intensive, supportive care for a mental health condition in a secure setting, Sheppard Pratt is here to help. With numerous inpatient units across two conveniently located hospital campuses, we offer the high level of care that meets your specific mental health needs. In our comforting, safe inpatient units, we serve children, adolescents, adults, and older adults with a wide variety of diagnoses. 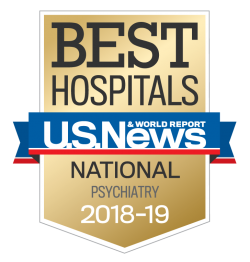 We are also proud to offer the intensive, specialized care and world class expertise needed to address difficult-to-treat diagnoses like eating disorders, neuropsychiatric conditions, trauma-related disorders, treatment-resistant depression, and co-occurring disorders. You can learn about the voluntary hospital admissions process here and the involuntary hospital admissions process here. The Adolescent Male Crisis Stabilization Unit at Sheppard Pratt’s Towson hospital is a safe and secure 20-bed inpatient unit specially designed for adolescent males ages 12 through 17. The Adolescent Unit at Sheppard Pratt’s Ellicott City hospital is a safe and secure 22-bed inpatient unit specially designed for adolescents ages 12 through 17. A highly specialized inpatient unit for children ages five through 17 with autism spectrum disorder and intellectual disabilities. The Child Unit at Sheppard Pratt’s Towson hospital is a safe and secure 16-bed inpatient unit specially designed for males ages four through 11 and females ages four through 12. The Co-Occurring Disorders Unit at Sheppard Pratt’s Towson campus is a safe and welcoming 20-bed inpatient unit that is specially designed for the treatment of adults ages 18 to 65 who are experiencing both a mental illness and substance use problem. The Crisis Stabilization Unit at Sheppard Pratt’s Towson campus is a safe and welcoming 22-bed inpatient unit that is specially designed for the treatment of adults with a mental illness. The Fenton Unit at Sheppard Pratt’s Ellicott City campus is a safe and welcoming 18-bed inpatient unit that is specially designed for the treatment of adult’s ages 18 to 65 who are experiencing psychosis. The General Adult Unit at Sheppard Pratt’s Ellicott City campus is a safe and welcoming 20-bed inpatient unit that is specially designed for the treatment of adults ages 18 and older who are experiencing a variety of mental health diagnoses. The Geriatric Neuropsychiatry Unit at Sheppard Pratt’s Towson campus is a safe, secure, and welcoming 14-bed inpatient unit that is specially designed for the treatment of older adults with dementia. The Intellectual Disabilities and Autism Unit at Sheppard Pratt’s Towson campus is a safe and welcoming seven-bed inpatient unit that is designed for the treatment of adults with severe autism spectrum disorder or a severe intellectual disability. The Psychotic Disorders Unit at Sheppard Pratt’s Towson hospital is a secure, calming 22-bed inpatient unit for adults 18 and older who are experiencing psychosis. The Young Adult Unit at Sheppard Pratt’s Towson campus is a safe and welcoming 14-bed inpatient unit that is specially designed for the treatment of adults ages 18 to 30 with a mental illness. A private pay residential program for the treatment of mood disorders, anxiety, addiction, and more.